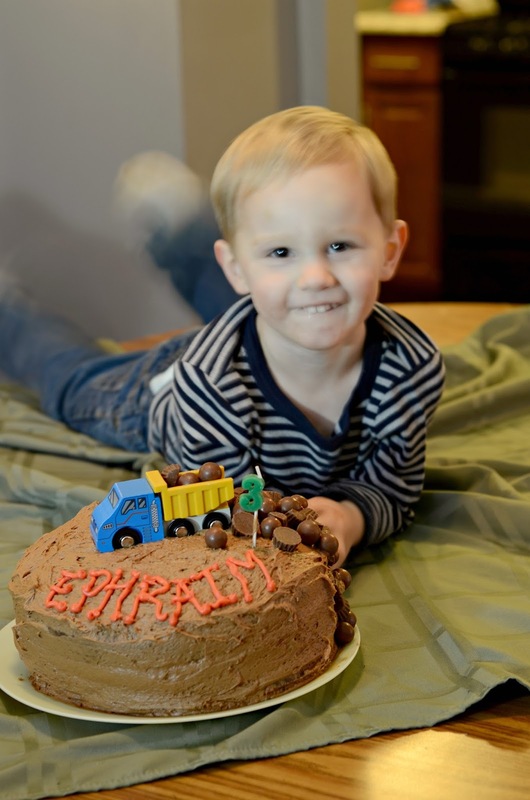 Our little buddy turned 3 yesterday! He is still just the sweetest, most easy going, content kid. I just love him. But, his latest trick is to make messes and then come tell me and say, "Ha ha, Mom!" I don't like to get too creative with birthday cakes. Art in the form of food or crafts is not really my forte. Ask me to write something or take a picture and I'd be happy to take a stab at it! ;) Anyway, a long time ago I saved this cake idea on Pinterest in hopes that someday I would have a boy, and also knowing that it was on my skill level. 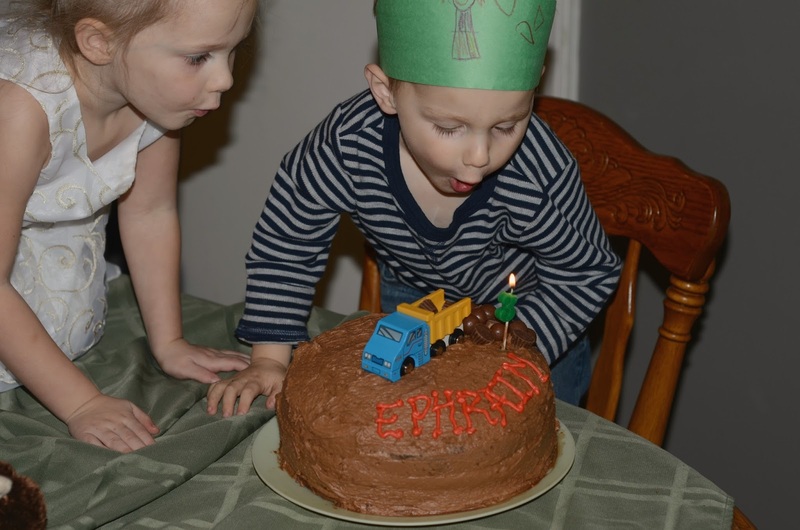 Luckily, this little boy loves trucks so he was elated with his cake! I made one of my favorite cake recipes. This is a chocolate malt cake, but if you're not a fan of malt, don't worry. You won't eat it and say, "This is a malt cake," most people won't even be able to tell. It just makes it moist and yummy. Are you saying, "What is malt?" Have you ever had Whoppers candies? That is what malt tastes like. I fell in love with malt when I worked at an ice cream shoppe when I was in junior high. Oh for the good old days. Malts used to be "the" milkshake back in the day, but for some reason they've fallen out of popularity. * This is a three layer cake, but I've made it a two layer cake before. *One of the keys to a good cake is that it is cooked for the right amount of time. 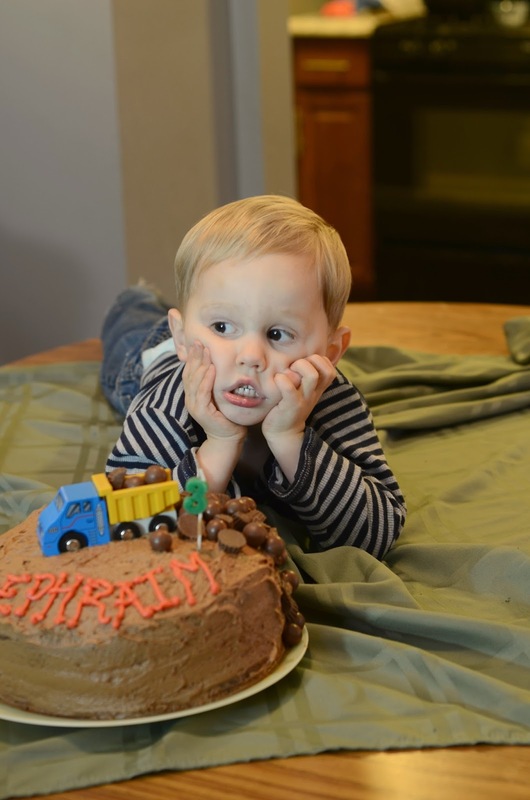 Nobody wants dry cake (unless you're my dad and you're pouring half-and-half on top of it.. right Dad?). It will take some trial and error, but don't overcook your cakes! *On the note of dry cake, use more frosting!! If you are making this cake as three layers you should be using ALL of the frosting called for. Especially in the middle layers, and make sure you go all the way out the edges. You're probably thinking, "This is too much frosting!" If you're worried about the calories, just have ONE piece of cake. You (and everyone else) will enjoy that piece oh so much more than two subpar pieces because you were worried about putting too much frosting on. *After I've made all that frosting, I don't really want to make any more. 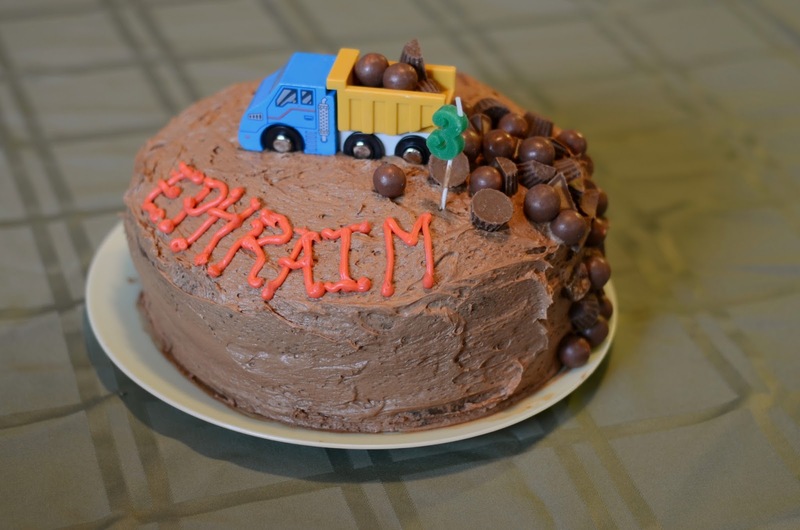 I used pre-made frosting to write Ephraim's name, with the smallest tip I have. It turned out great! *Using good cocoa powder makes chocolate things taste better. I used Ghiardelli brand. *Did you know that they make specific flour just for cake? It's called cake flour. 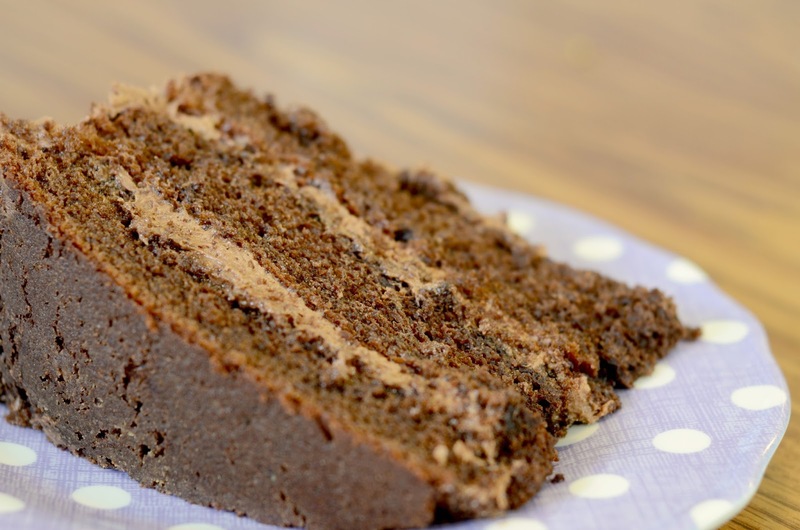 It has a finer texture and makes cakes taste better. *You can fix bad cake!! When I cooked this cake, there were a few parts that were overcooked. I just ripped them off and cut the top to even it out. The rest of the cake was super moist (My oven cooks unevenly). *You can freeze the cake layers to make them easier to frost (this is especially great if you are having to rip off overcooked cake). They don't have to be completely frozen, but the colder they are the easier it is to spread the frosting. *On that note, chilled cake (putting your completed cake in the fridge) tastes better than if you leave it out on the counter until it's time to eat. *I didn't have this skill 5 years ago. You are not going to make an awesome cake your first time. If you make a cake and it's a dud, don't say, "Well I guess I'm not a baker." I am no amazing cook, but I am way better than I was. If you want to get better at something, it takes practice. The next time you eat a piece of cake you like, note what kinds of things you like about it. Try and look for a copycat recipe. Food bloggers have demystified a lot of the tips and tricks around making great food, learn from them. You CAN make and eat great food in your own house! Also, it brings me a lot of joy to create something so delicious that other people like to eat. Try it! Preheat oven to 350°F. Grease and flour 3 (9-inch) cake pans. In the bowl of an electric mixture, combine flour, sugar, cocoa, baking soda, baking powder, salt, and malt powder. Add milk, oil, and eggs to flour mixture, beating at medium speed until smooth. Add sour cream and vanilla, beating just until combined. Pour batter evenly into prepared pans, and bake for 20 minutes, or until a toothpick inserted in center comes out clean. Let cool in pans for 10 minutes. Remove cakes from pans and let cool completely on wire racks. To make the frosting, in a large bowl, beat butter and cocoa powder at medium speed with an electric mixer until creamy. In a small bowl, combine cream and malted milk powder, stirring to dissolve. Add cream mixture to butter mixture, beating at low speed to combine. Gradually beat in confectioners' sugar until smooth. Spread frosting between layers and on top and sides of cake. Garnish with malted milk balls, if desired. Oh yes, nice, sort of dry, chocolate cake with half and half, or glucks of cream off the top of a gallon of whole (really whole) milk fresh from the barn. Do you think home made, from scratch, frosting tastes way better than what you buy in the store? You might think it's blasphemy Dad, but yes I do!